It seems like I just started the Elvis Costello Weekends. I can’t believe I’ve already arrived at Mighty Like a Rose, his 1991 follow-up to Spike. I consider this album the bridge between Costello’s classic years and the more wide-ranging experimental work he did later in his career. And I guess the real surprise is that this album is now nearly 20 years old, and he’s recorded more albums since its release than he did beforehand. It’s not the Elvis Costello Weekends that are moving quickly… it’s my whole life! I count this album as one of Costello’s few disappointments. He seems to be more concerned with production than songcraft on these tracks, playing up the Beatles and Beach Boys touches and doing more with percussion than he had on his previous twelve records. The best song on Mighty Like a Rose towers above everything else on it. ‘Couldn’t Call It Unexpected No. 4’ is one of my favorite Costello tunes ever, but I can’t feature it today because I’ve done so already on the blog. The album is worth owning for that song alone. Today’s selection is the opening track, ‘The Other Side of Summer,’ on which those Beach Boys touches are extremely obvious. I remember keeping MTV on in the background for days when this album first came out hoping to catch the video for this song. I did one or two times, and was treated to the sight of Costello almost double his usual size and wearing a comically thick beard. Was it a millionaire who said “imagine no possessions”? A poor little schoolboy who said “we don’t need no lessons”? 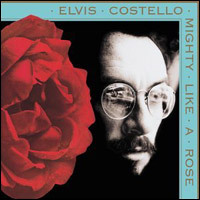 This entry was posted in costello weekends and tagged Elvis Costello, Mighty Like a Rose, The Other Side of Summer. Love your observation that it’s not the weekends, but your life, that are speeding by. So true! It does feel like just a few years ago that you and Dana bought this album. I would have sworn it was a relatively recent release. Just crazy. As I said on the post for the song you love from this album, this whole album has missed me entirely. I never listened to it other than a few times here or there in the car. So this is all new to me. I kind of dig the Beach Boys production sound, but I certainly wouldn’t want to sacrifice what is best about Costello for such flourishes. You believe he became experimental after this album? Seems to me that the man who went from Imperial Bedroom to King of America proved his experimentation long before this record. In fact, with the notable exception of the Juliet Letters, I’m not sure he has really been all that experimental in the past 20 years. As for today’s song, it always seemed to me that EC was trying a bit to hard to have a single or hit with this one, though I still kinda dig it. He’d certainly explored different styles before this album, but within the same basic Costello-ian framework. In later years he’d write ballet scores, chamber music, operettas, torch albums, all sorts of weird tangents.